I would say this cake is so beautiful and delicious , however is really a very girlish kind of dessert. 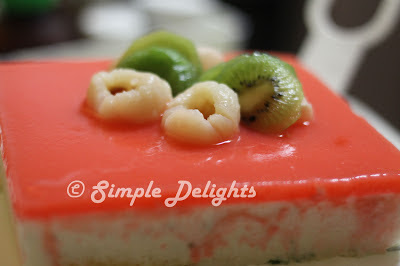 Lychee with lime , the sweet and sourish will be love by all girls.Sorry to say that I make this cake for a guy on his birthday and it happened in May ( I am way behind a lot of my blogging ..sigh..). No mean to insult him or anything of that sort. It just me.. I saw this post in nasilemaklover and have been wanting to try it out. I love lychee and knew surely is a good combination to go with lime. To avoid contributing the weight on my love one, I usually do not make fancy cake in the weekday unless we have special occasion to celebrate. Birthday is always one of the great reason to have sweet and fancy cake on the table after the celebration. So despite is a birthday man celebration I still choose to do what I want to do then to do something the birthday man might like :) I often told my friends, sorry is about you in the celebration but is not about you in the cake . Hahahaha I guess most of the man do not mind. At time they do not even mind any birthday celebration. Is just another reason to eat and that is good enough. So here is the recipe, I half the portion as not many of us in the celebration and I just do not want to overeat . Trust me, we always seem to eat more than we should. 2. Place unsalted butter and milk together in a bowl using double boiling method to melt the butter and combine well with the milk. 4.Continuing beating the egg mixture and be careful not to cook the egg mixture, used your finger to test the temperature of the egg mixture, when is warm take the mixture away from the steaming water. 5. Beat the egg mixture till pale and thick in volume.If you can draw a line with the mixer and the line will not disappear then is done. 6.Fold in the flour into the the egg mixture with spatula in 3 separate portions. 8. Pour in the well mixed butter milk and the lime zest into the cake mixture and mix until well incorporate. 10. When done baking , let the cake cool in the mold and take it out set aside for later use. 1.Put 3 Tbsp of water in a bowl sprinkle the gelatine powder on it and let it bloom. Put in a bowl of hot water to have it melt and set aside. 2.Open lychee can and leave aside 6 pieces of lychees for decoration ( or any of your choice). 3.Weight the rest of lychees plus syrup to 350g . I take the advise from the recipe to have more lychee then the syrup. Process them in a food processor, strain lychee puree, weight lychee puree 150g for jelly topping and set aside for later use. 4.Blend the lychee bits again after the puree have been strained with a blender until fine. Add back to the balance lychee puree weight 200g for mousse making. 5.Add sugar into 200g lychee puree, mix well to dissolve. Put in the key limes zest, lime juices and yogurt in the mixing bowl combine well and set aside. 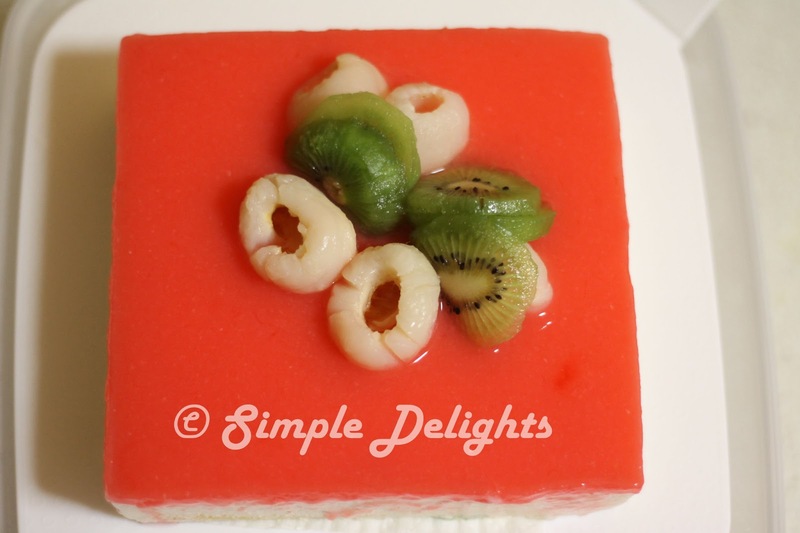 7.Fold the whipping cream into lychee yogurt mixture add in gelatine at last and mix well to combine. 8. Pour the mixer onto the cake in the cake pan and refrigerate at least for 2 hours or till the mousse set. 1.Sprinkle gelatin onto the water in a bowl. Place this bowl in a bowl of hot water to melt the gelatine. Leave to cool. 2.Mix sugar with lychee puree, stir to dissolved. 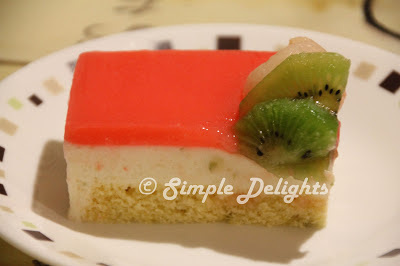 Add in gelatine and pink coloring. Pour on top of lychee mousse layer. Have the cake refrigerate for another 3hours or overnight. Remove mousse cake from cake pan by wrap the side of the pan using hot tea towel. I decorate with lychee and kiwi. I reckon the green go well with the red color. The cake is refreshing in term of taste and a slice of it is simply not enough. It does not make you felt guilty if you have a big piece. Possibly because the light texture of the cake you do not mind to have a bigger slice . Everyone love it and what more satisfied is the dinner end well with a good dessert. I will make this cake in a bigger size next round and perhaps with another layer of sponge cake in between to add the volume to this cake. I am sure this is a good dessert in a summer night.